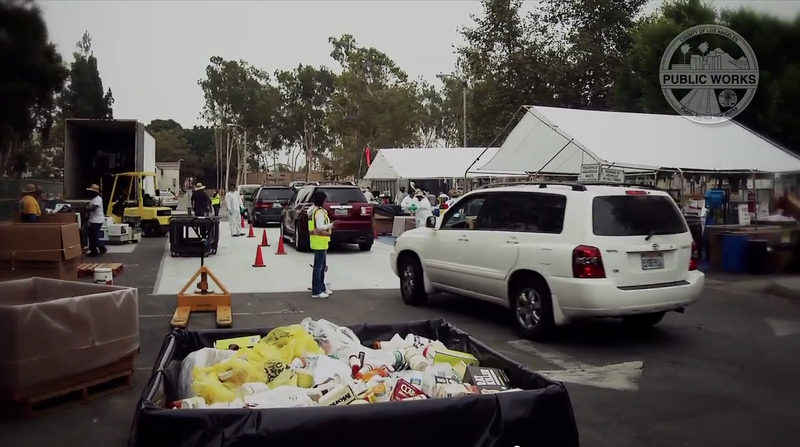 The Household Hazardous Waste (HHW) Collection Events, operated by the Los Angeles County and Sanitation Districts, are FREE one-day, drive-through collection events where residents can drop off their HHW and electronic waste (e-waste). Most events are held on Saturdays from 9 a.m. to 3 p.m. and are open to all Los Angeles County residents. No appointment is needed. In addition, all Los Angeles County residents may utilize the City of Los Angeles S.A.F.E. permanent collection centers (various locations), the Antelope Valley Environmental Collection Center (Palmdale) or EDCO Recycling and Transfer Center (Signal Hill) to properly dispose of HHW/E-Waste FREE of charge. Please note that there is a limit of 15 gallons or 125 pounds of household hazardous waste per trip. Pack HHW in cardboard boxes to avoid spillage during transport. Be prepared to leave your containers and boxes at the site. Keep items in their original containers. Do not mix products. Put like chemicals together. Separate unlike chemicals. Label materials that are not in their original containers. Make sure containers are not leaking and lids are tightly sealed. Put your boxes in your car trunk, away from passengers during transport. Remove all other items from the trunk. At the event, trained personnel will ask you to remain in your car while they remove the HHW from your trunk. HHW and electronic waste from businesses. Explosives, ammunition, marine flares, and radioactive materials.